Monitor network devices and servers with 10-Strike Network Monitor! 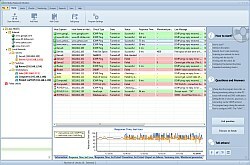 This network device monitoring application allows you to monitor a wide range of network devices connected to your local area network (for example, servers, managed switches, routers, printers, UPS, etc.). The program detects failures in time and ensures a prompt response to the failures. The program polls network devices by sending them ICMP ping packets, attempting to connect to the required TCP port, checking a switch via the SNMP protocol (check whether a particular MIB value meets a defined condition, for example), checking file existence or free space on a server, etc. Depending on the result, the program responds proactively. These actions may include: displaying a message, playing a sound alarm, running programs, writing to a log, sending SMS or e-mail message, restarting/shutting down a service or a computer. 10-Strike Network Monitor can monitor many types of network devices: FTP servers, Web (HTTP) servers, database servers, file servers, DNS servers, switches, routers, network printers, etc. For example, let's consider in details how the program monitors web servers. The HTTP check allows monitoring the state of a web server. With this check, you can constantly monitor the availability of your web server. The check consists in attempting to connect to the web server by sending the 'GET' query. The application analyses the server's reply and determines the state of the web server. The most important is that the program can monitor and respond to the change in the content of the web page, promptly notifying the site owner on the occurrence of deface or web server errors. 10-Strike Network Monitor also displays colorful charts showing response times of the network devices. By analyzing the charts, you can understand when the response times raise, your network's bandwidth is low, or the server's load is too high.